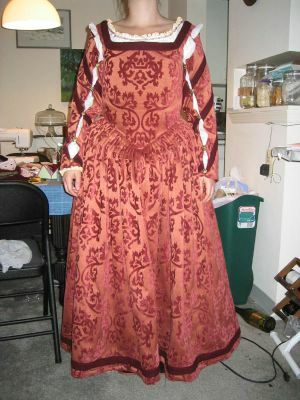 Julie's Venetian Courtesan: ITS OVER!!!! Yes, I think I'm officially finished with this dress for some time. Okay, still wanna do a partlet. But that will wait. Especially after learning that Beth is not partletting this time around, either (despite making a beautiful one!). I will be like her and delude myself that i'm making one for october. Actually, I'm fairly certain that I will. Just in good time. This Saturday is the unplanned "early" weardate, and the "real" day is to be sometime in October at the MD Ren Festival. I've neglected my blog for the past few days in the interest of finishing fiddly bits before posting. I've hemmed the sleeve bottoms, added utility loops for attaching items to my waistline, hookneyed the slits under the lacings, trimmed all long threads. 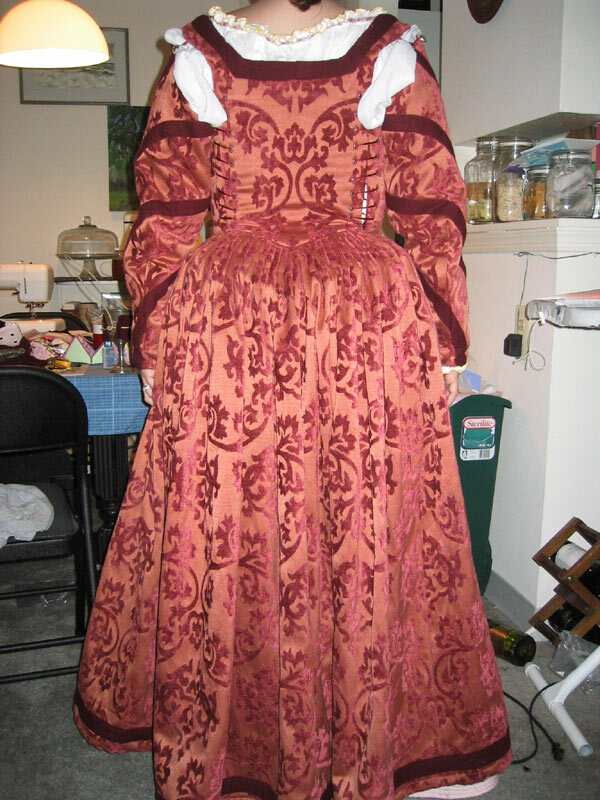 I've also hemmed the gown (a bit shorter than i intended), and attached one guard of the burgundy wool. I'm still considering a second guard for later, but for now, I'm thinking one is just dandy, especially with the time contraints AND my need to feel reasonably finished for saturday. These pics are all sans accessories, but i'll have my fill of pics in the whole getup come this weekend! 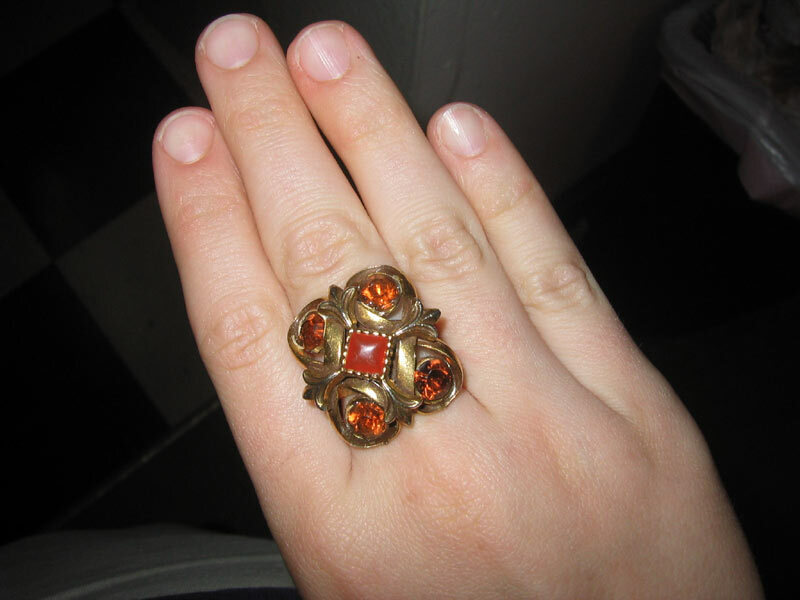 ring of power! NOtice my newly shorn fingernails--a sacrifice to the lute lesson gods! The cool thing is that this store also sells these in white, and as i'm pretty sure they're cotton I could get white ones and dye to match future outfits. Huzzah! There shall be a feast of photos early next week! I'm so excited! Oh turd! The Festival is Saturday. I better start my dress! ;) Just kidding, no staying up late for any of us (well not for dress purposes). Your dress is incredible! I am so excited to see you (and it) in person tomorrow! I love the candy-striped sleeves. Delicious. 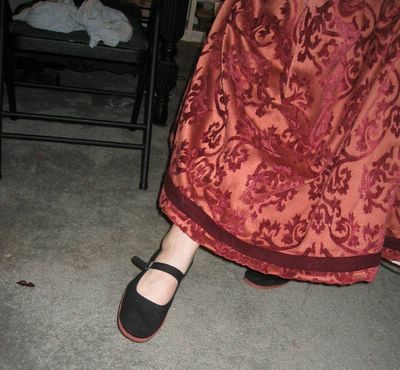 Oh, and if those china flats are $3.50, you might be getting requests for them in white. I really like the shoe dyeing concept. I don't know where to get them in white around here. And I've never seen them that cheap. Shoe size? I could easily pick them up before i leave tomorrow--otherwise we'd probably have to mail. They really are only $3.50. And the mall is 5 mins from my apt!